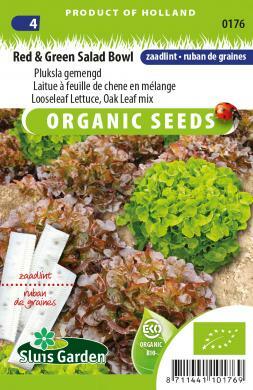 Organically grown seeds • Seed tape is quick and easy. It is made from paper which dissolves in the soil. Lay the seed tape on a flat seedbed, wet it and cover with approx. 0,5 cm of soil. Thereafter, keep moist. A red and green looseleaf lettuce with oak leaf-shaped leaves. Salad Bowl has tender leaves that are yet somewhat crispy. It has a strong, slightly nutty flavour. Can be grown in a greenhouse (ventilate during warm weather) and can be sown directly in the garden as of mid March. Keep seeds cool in the summer.